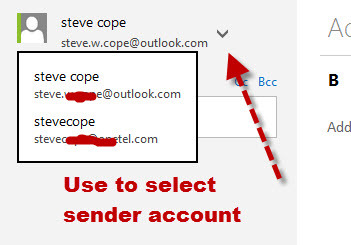 A useful feature of Outlook.com is the ability to access other mailboxes. This main use of this feature is to access multiple accounts and consolidate them into a single mailbox. Use Outlook.com to access a mailbox that doesn’t support webmail access. Useful if you require remote access (e.g. when on holiday). Import email from another email account into Outlook.com. Useful if moving provider. To illustrate I will set up outlook.com to access email from another email account so that I can use outlook.com to read and reply to email that gets sent to that account. By doing this I don’t need to login to two separate email accounts to check my email. Like Gmail and Yahoo, that also support this feature, Outlook.com uses the POP3 protocol to read the email from the other email account. When sending email you can use the SMTP server from either account. 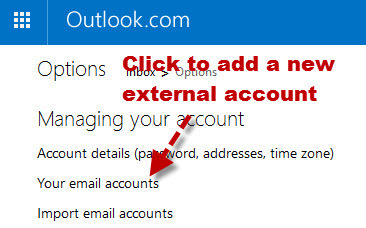 Login to Outlook.com and go to options and click your email accounts. then click on add a send and receive account. You now need to enter the account details of your account. This is exactly the same settings you would use when configuring a standard desktop email client. Because it uses POP3 it is a Good idea to leave a copy of the message on the server so that you can access it using other clients. 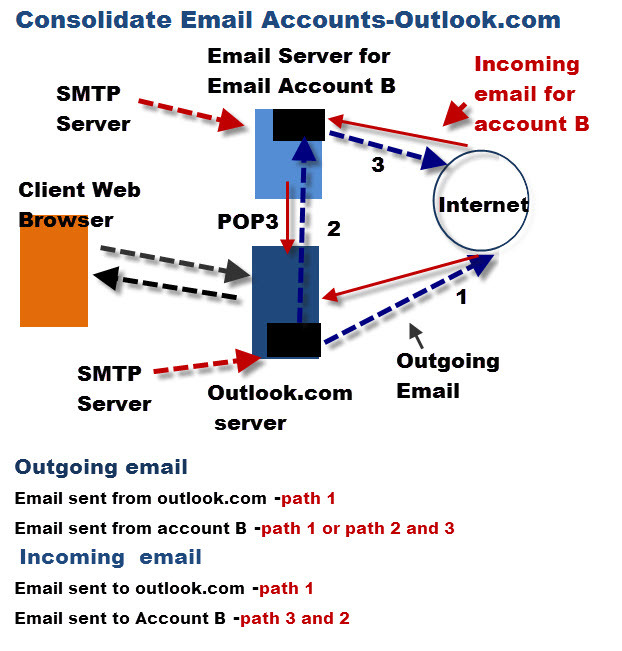 For sending email you can use the outlook.com SMTP server or the SMTP server from you other account. Important – However the big advantage from sending using the outlook.com server is that the outgoing mail is placed in the sent items of your outlook.com mailbox. If you send it via the SMTP sever for your other account then sent email is placed in the sent folder of that account. When done press continue and you will need to choose a folder that will be used to store the email for this account. 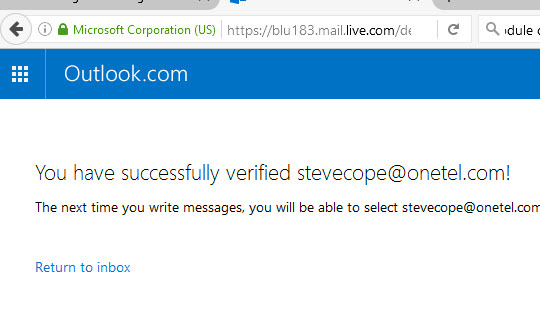 You get a message saying that you need to verify the account and an email will be sent to the email account you are adding. When you click the link you should get a message that the account has been verified and is ready to use. If you look now at your email accounts you should see that you account has been added. 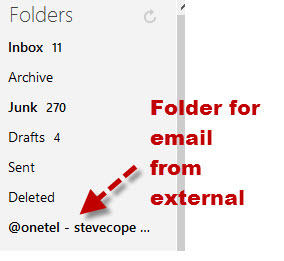 If you go to your inbox you can see the new folder that contains the emails from the external account. Now when sending an email you can send from either account by selecting the account using the drop down arrow. Periodically the outlook.com server will connect to the mailbox of your account and download the emails. These emails are placed in your designated folder. Depending on how you configured the access (leave email on server) the email in the original mailbox will be deleted or left there. When you send an email the email will be placed in the sent folder of the account you use for sending. 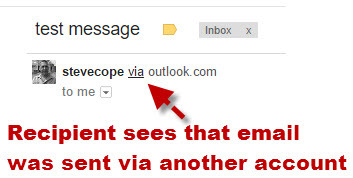 If this is the outlook.com account then they appear in the sent items folder just like email that you send from the outlook.com account. When consolidating emails into Outlook you need to decide whether or not you will still access the email account using another email client/computer. If you do then you need to be aware of the email settings on that computer/client. I would recommend that you set that client to leave emails on the server so as to avoid conflicts. 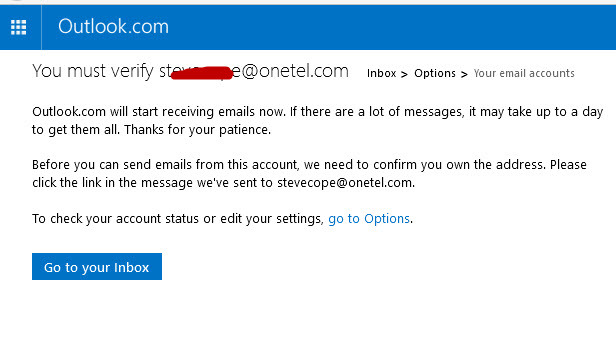 Q- I’ve configured outlook.com to read emails from my other account but i find that there is a noticeable delay when I send an email to the account and that email appearing in the outlook.com folder. Why? A- This is because the outlook.com checks for email on a periodic basis, and you have to wait for it to check before it receives the email. Q- I appear to be missing emails from my other account? A- This is probably because you are accessing the account using another POP3 client and that client is deleting the email from the account. 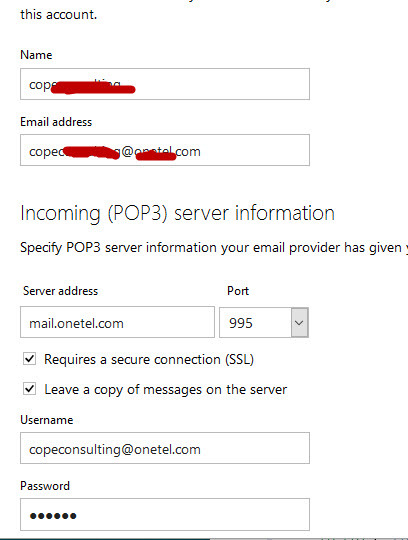 Q- I normally access my other email account using IMAP will this still work as outlook.com is using POP3. A- Yes most email providers allow you to access a mailbox using several protocols.